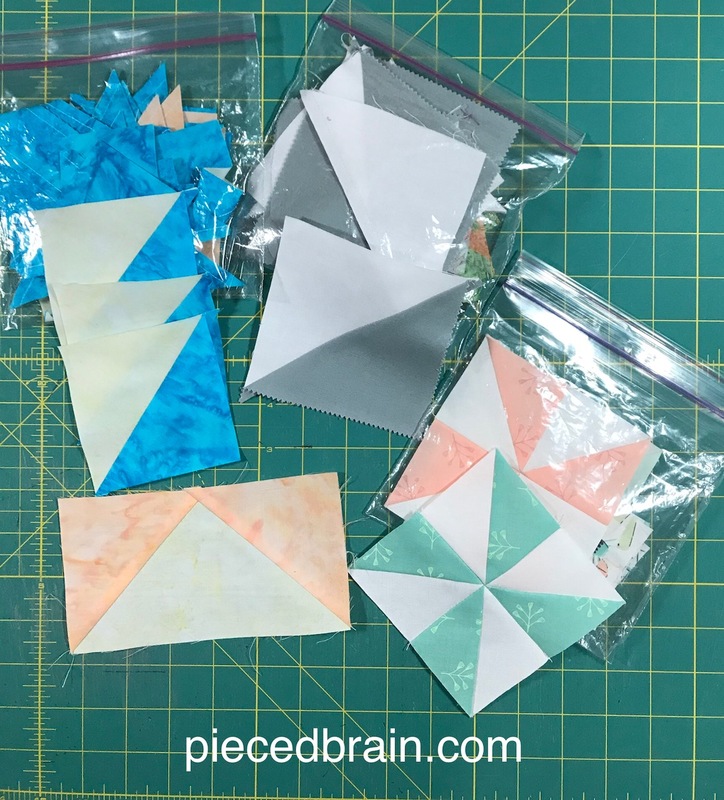 I was looking through my fabric drawers the other day and found little bags with orphan blocks: half-square triangles, flying geese with beautiful colors and perfect points, leftover blocks from quilts. Wondering aloud what I would do with all those 'half-way' quilts as I call them, I began to put them in bigger bags ( ! ), combining the colors that might go together well and thinking of how I could work them all into quilts. That is when I remembered I had received for review a book from Martingale by Kim Diehl: Simple Whatnots - A Batch of Satisfyingly Scrappy Little Quilts. That was just what I needed! 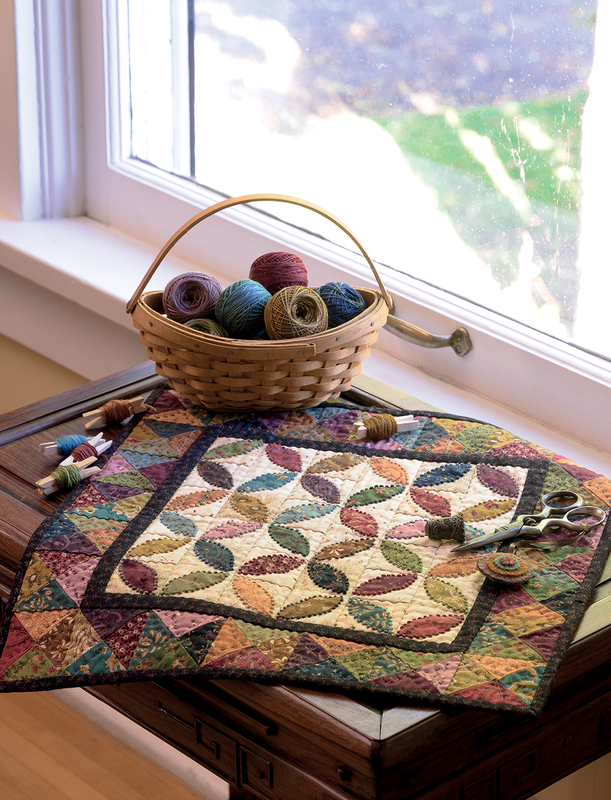 Simple Whatnots has 18 small projects perfect for the bits and pieces of fabrics we accumulated throughout the years. Many of the quilts use small squares and rectangles - I am thinking about all that leftover binding I have collected. 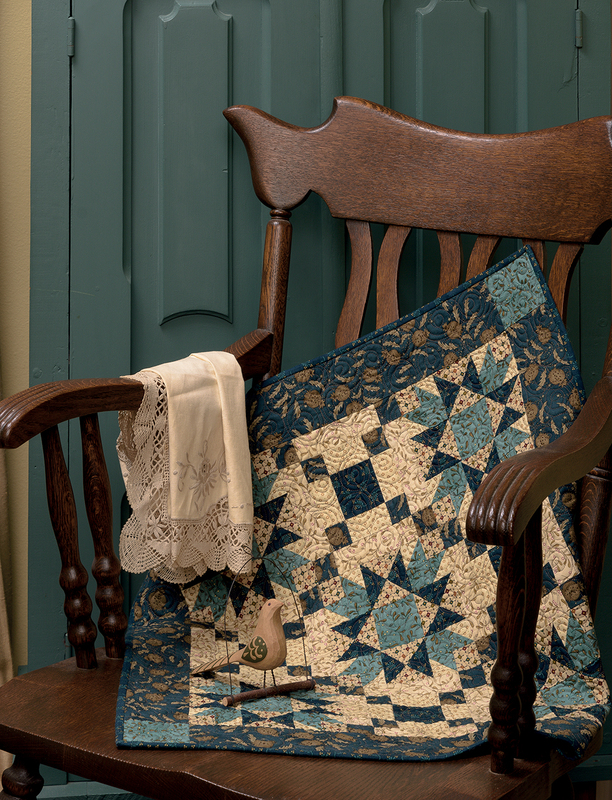 Kim Diehl's quilts showcase reproduction fabrics in fun, creative, and colorful designs. Of course, my stash of reproduction fabrics is not as large as hers so I will use batiks and other fabrics to make quick gifts for my family and friends. Another reason why I like her projects: they are manageable to free motion quilt on my Bernina as my wrists can no longer handle larger ones. This is Vintage Button Box: four Churn Dash blocks and all the little squares you have and can't bear to throw away will become a fun 15-1/2" square beauty. The Mini Orange Peel has 2" orange peel blocks surrounded by French Knots. The embroidery adds an unexpected texture to the orange peels. My favorite method of applique' is machine applique' so I would probably use a decorative stitch around the shapes with heavier weight thread instead of hand embroidery. Speaking of applique', Hopscotch has lots of movement with its appliqued floral medallion and the flying geese on the borders. 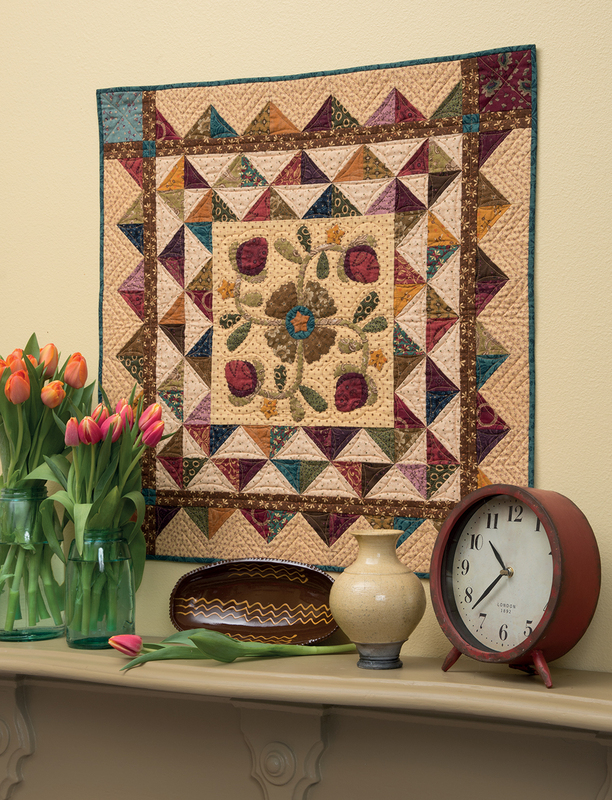 Think how your scraps would look amazing on this design! True Blue has four easy 6" chain blocks and five Star blocks and measures 23-1/2" square. I think a purple and lavender version of it would look fantastic! 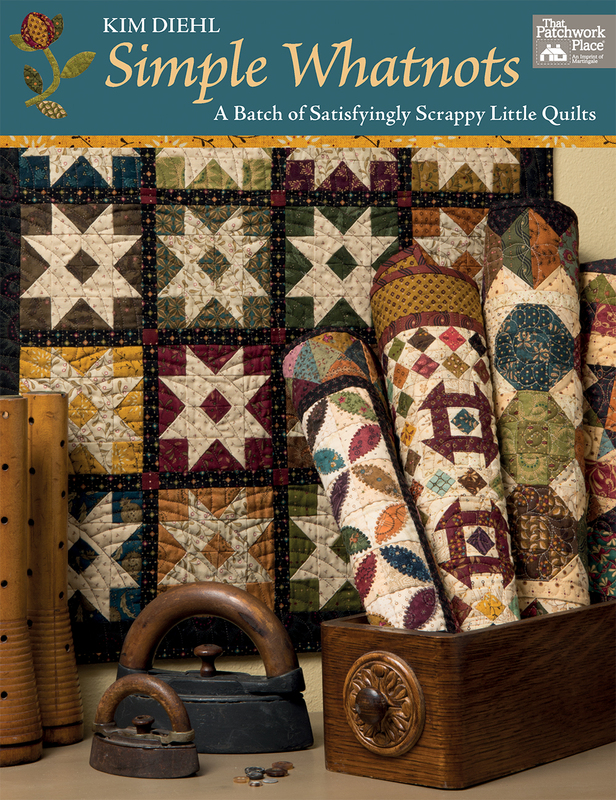 There are 14 other quilts equally fun so you may want to check it out either in print or as an eBook. I have many of Kim Diehl's books and am always rewarded with inspiring designs, great tips, and flawless instructions. Since I follow her on Instagram (@kim_diehl_quilts), I can also count on her mouth-watering recipes. Simple Whatnots - A Batch of Satisfyingly Scrappy Little Quilts is a terrific addition to my library and will actually be kept in my scraps drawer so I do not have to spend time figuring out on my own how to use them. I just have to choose one of her designs and have a project done in one day. I love when I get a package in the mail from Martingale - my family knows what I am doing when they hear the 'ahs' and 'oohs' as I flip through the pages of each book. I am not affiliated with them - I just like to share with you what I like and hope you enjoy taking a peek at their books. Eye candy! So many beautiful small quilts to sew! They are awesome... Sometimes we complicate more than we need! I so want to make them! I am hoping to get a chance soon because my stash is sort of getting out of control! Boa ideia! E sao presentes rapidos de fazer! Beijos!